Imagine that an author (mystery author) put out a call for her fellow authors to join her in a multi-author promo. Imagine that same author’s surprise when dozens of her author friends responded. Now imagine what that large group of mystery authors could do if they worked together. Well, you don’t have to imagine anymore because those dozens of authors have put together the Mystery Lovers’ Mega Sale with over 100 FREE & 99 cent mysteries for mystery fans. If you like cozy mysteries, we have something for you. If you’re a fan of paranormal mysteries, we have something for you. If you love romance mysteries, we have something for you. If you love women sleuths, meddling octogenarians, nosy neighbors, curious snoops, or anyone who can’t help but want to dig for clues, we have something for you. Go forth and shop or download your heart out. This weekend only! Sept. 7th – Sept. 9th. It is no secret I am a fan of Sharon Mierke and her writing. I read Virtual Enemies a couple of years ago and I decided to read it again. Beryl Swallows goes back home to attend the funeral of a classmate who committed suicide. She hadn’t seen her classmate or her friends in years. It seemed everyone had a secret and that included her dead classmate Mary Lou. I find Sharon Mierke books comfortable reads. By that I mean they take you along with characters as if you fit into their lives and are standing right there observing everything. Not only did this mystery remind me we occasionally find the people who used to be important in our early years may change so you can’t really go back home. The book moves along easily but at no point could I guess whodunnit and believe me as a mystery writer I like to figure it out early in the book. I am moving on again to her other books, the ones I have read and the ones I haven’t put on my kindle yet. Take the time and see what Author Sharon Mierke has to offer. You won’t be disappointed if you like Cozy Mysteries. When Beryl Swallows attended the funeral of a former schoolmate, Mary Lou Sanders, she had no idea that instead of renewing old friendships, she would be making new enemies. She also did not know that she would find herself immersed in a murder investigation – hired for big bucks by Mary Lou herself. The question was: Was Mary Lou murdered or did she really commit suicide as her note indicated? After not seeing her former friends, Lydia, Julia and Esther, for almost thirty years, they were virtually strangers or as she was to find out, virtual enemies. Sharon Rose now writing as Sharon Mierke! Sharon Mierke’s mother was a writer and her father, a photographer, so it seemed natural to drift into the writing field and also keep her love for photography. She began writing many years ago but it wasn’t until her four children had left home that she began to do some serious writing. While taking a three-year writing course, she had several short stories published and two novels: Who Needs Enemies? and Missed by a Hair (both now out of print). Sharon enjoys writing mysteries and historical fiction. Her book, Virtual Enemies, is a mystery and introduces readers to Beryl Swallows, a retired police officer and now private investigator. In Virtual Enemies she is hired to solve a murder – by the victim herself. A mystery within a mystery. This is the first in the Beryl Swallows Mysteries. In the second, Case Closed.not, Beryl finds one of her mother’s old diaries and it takes her back into a past she never knew existed. Was her own mother a murderer? Sharon has four current books in the Mabel Wickles mystery series: Deception by Design, Calamity by the Car Wash, Cold Case Conundrum, and Frozen Identity. Mabel is good at finding trouble; however, along with her friend, Flori, and other Parson’s Cove citizens, she always seems to find the way out. And find the guilty party. Besides writing mysteries, Sharon writes historical fiction. Her first historical fiction, Sarah’s Valley, carries us on a journey from the east coast of the United States, through the Midwest, and up into Canada. Her second historical fiction, The Widow’s Walk, centers around life in the early 1800s on the Texas Panhandle and down to the island of Galveston. The sequel to Sarah’s Valley, Return to Sarah’s Valley, is now available on Amazon. Now it is Patrick’s turn to tell his life story to one of Winnipesaukee’s descendants. Sharon Rose Mierke and her husband live in Manitoba, Canada, where the summers are hot and the winters, cold. They have four grown children and four grandchildren. Sharon’s hobbies include reading, scrapbooking, and photography. Thank you MJB Teviewers for having me. Make sure you visit the blog for a chance to win. I am so happy to be hosting a Series Spotlight and Give Away for author Julie Seedorf. 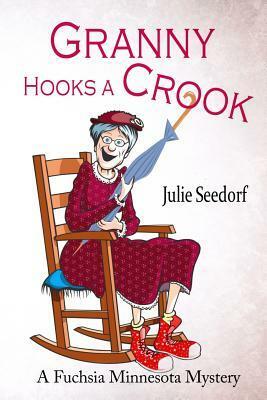 Julie writes A Fuchsia Minnesota Mystery series, starring Granny, and the series is very funny, entertaining and have great mysteries to solve.